The year is 1869. Charles Dickens wrestles with the plot of his latest (destined to be his last) novel The Mystery of Edwin Drood. A deadline approaches, the pressure is on from his publisher! But Dickens is also preparing for a new tour of his readings. Add distractions from his loyal household staff…Will the great man finish his new book in time? Join us as we meet some of Dickens’ unique characters in scenes from his famous, and his less famous works! The Life and Adventures of Nicholas Nickleby, Oliver Twist, The Pickwick Papers, A Christmas Carol, A Tale of Two Cities, The Signalman, Our Mutual Friend, David Copperfield and the Old Curiosity Shop, all explored and put into context, using Dickens’ own words. 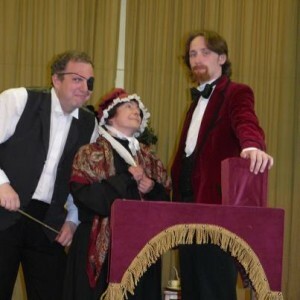 A cast of three will bring to life 29 of Dickens’ most loved characters with dramatic style and flair!